Although the top two schools in the CALABARZON are from the Province of Laguna, five of the eight colleges and universities in Batangas whose graduates take part in at least seven licensure examinations were ranked in the upper third among thirty-five other schools which meet the criterion. The remaining three schools were in the middle third. What this basically tells us is that the University of the Philippines at Los Baños apart, the standard of tertiary level education in Batangas is generally higher than those in other provinces of the CALABARZON region. 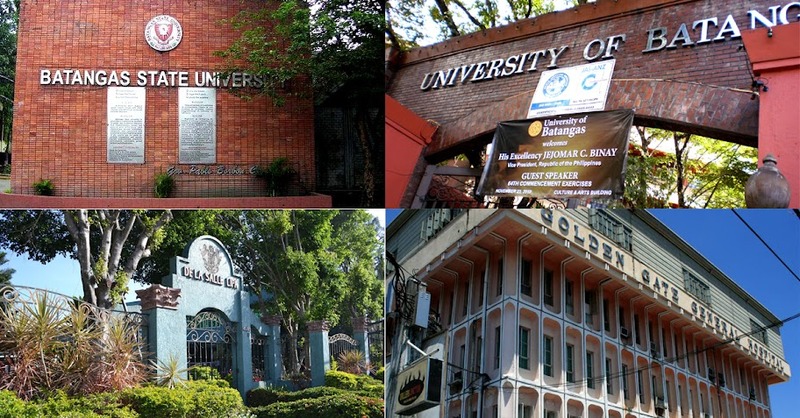 FindUniversity.ph ranks colleges and universities on the basis of how their graduates performed in the past four examinations, counting only the first time exam takers. Schools with less than ten first-time examiners are not ranked. The full methodology will be provided at the bottom of this article. All readers are advised to please note school rankings change over time as new licensure examinations are administered. Naturally, how the graduates of each school perform in subsequent examinations will affect their school’s ranking. The rankings presented in this article are dated February 2017. De la Salle of Lipa City is the top-ranked school among colleges and universities in Batangas as of February 2017. The school has a weighted ranking of 82.8% from eleven licensure examinations, also good for third in the CALABARZON and seventeenth nationwide. The First Asia Institute of Technology and Humanities is second with a weighted ranking of 76.1% from nine licensure exams. This means that the school is sixth in the CALABARZON and 35th nationwide. Although the Lipa City Colleges are last among eight Batangas schools included in the rankings, to put things in perspective, the school is at twenty-second in the CALABARZON. This means that there are thirteen other schools around the region ranked below it. The school is also ranked a very respectable 124th among 259 colleges and universities nationwide. Below are tables showing how the different colleges and universities in Batangas performed in licensure examinations by academic program. Only programs that are offered in at least two schools are included in these comparative tables. To better understand how the rankings were arrived at, please refer to the methodology used at the bottom of this page. This was taken from the web site of FindUniversity.ph. The official ranking presented here contains schools that were ranked in at least 7 board exams.